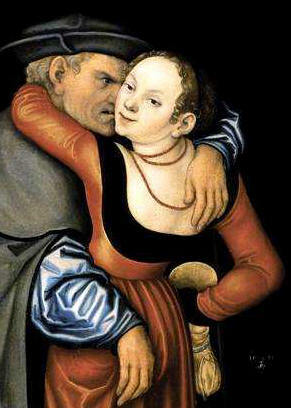 A gazillion people have already studied the Cranach gown, so I don’t expect that I will come up with something new. However, I have discovered something that I have not seen come up in any other Cranach study, so I thought I should write it down. To make such a ‘German’ gown, of which none, to my knowledge, survived, it is necessary to find out what the gown consists of. 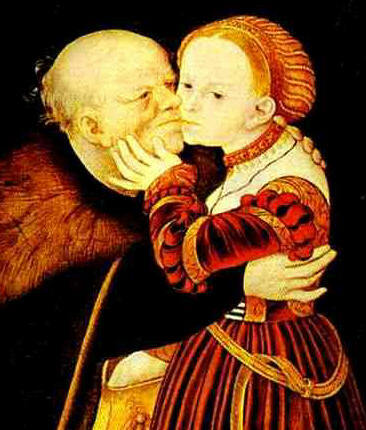 I came up with the following and will base my studies on various paintings of Lucas Cranach the Elder. it sometimes seems as if the skin towards the gown (seen running from the border of the chemise) is a bit lighter than above that border. 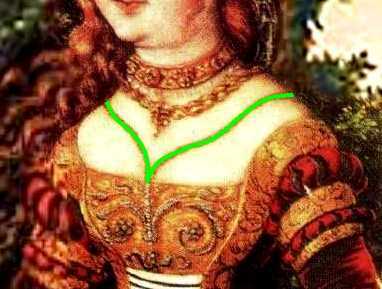 All this makes me think that this heart-shaped line, which, as I have already said, can be found in almost all Cranach paintings (except for some – but I’ll get back to that later) is the trim along the neckline of a chemise. Keep this coloring scheme in mind, as I’ll use it from now on for explanations. Many people who made reproductions of the Cranach gown came up with many solutions: Pinning the Brustfleck to the corset, to the side guards, sewing it to the side guards etc. 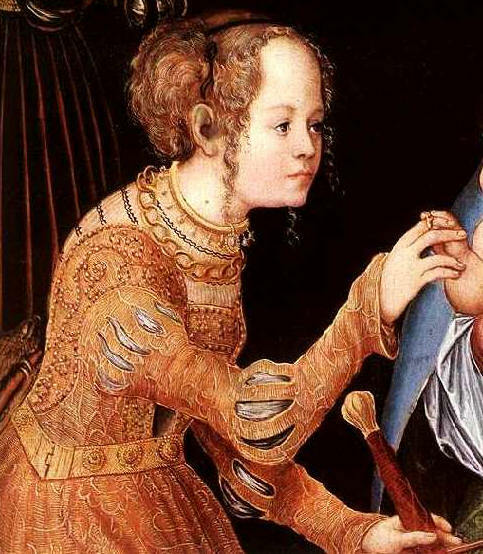 I have searched and searched countless Cranach paintings for any hint how those gowns are actually constructed. And – surprise, surprise – I came up with something. 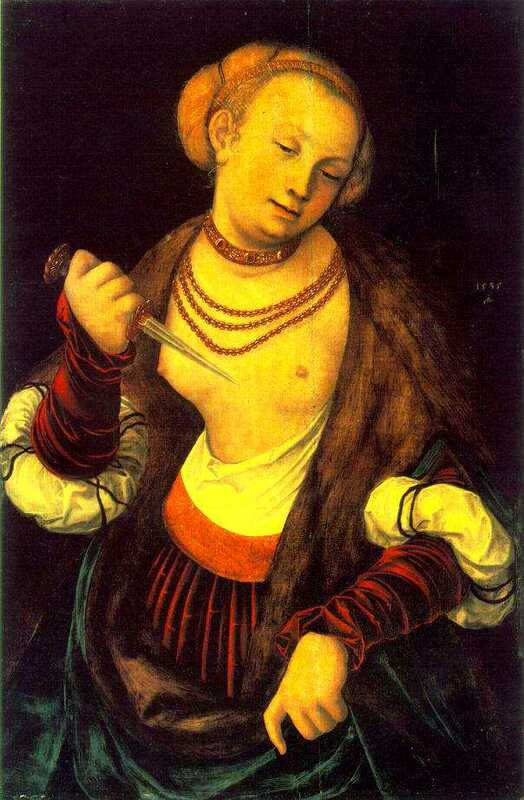 Now – Mr. Cranach was not a modest man when it came to painting women. In fact, he painted quite a number of them bare chested. And this is where it becomes interesting. Note how the pink lacing seems to be fastened to something *below* the green side guard. I can’t see the Brustfleck anywhere; but the white fabric below the lacings is obviously still there. Note that there is *no* heart-shaped chemise neckline in this picture, either. This picture, again, shows neither a Brustfleck nor the chemise neckline trim. This picture is different from the two others. Note, again, the absence of the neckline trim, Brustfleck and lacings – but in *this* picture, the skirt is obviously sewn to the bodice and has an opening in the front. This version shows another interesting thing: The Brustfleck – obviously lined in white – seems to be flapped down, and the lining seems to be much longer than the embroidered Brustfleck, therefore forming the white part that is to be seen below the lacings. As there is no visible trace of the lacings, I guess they must be below the flapped down Fleck. As you can probably see, there is something (marked blue) hanging down. This ‘thing’ is obviously a rectangle and attached to something on the right side of the bodice. Its original position is, also obviously, *above* the lacings and also *above* the white fabric below them, but it’s still over the chemise, which is very transparent. However, the white fabric under the lacings seems somewhat… well… torn. It looks as if the rectangle that’s hanging down has been torn from it. 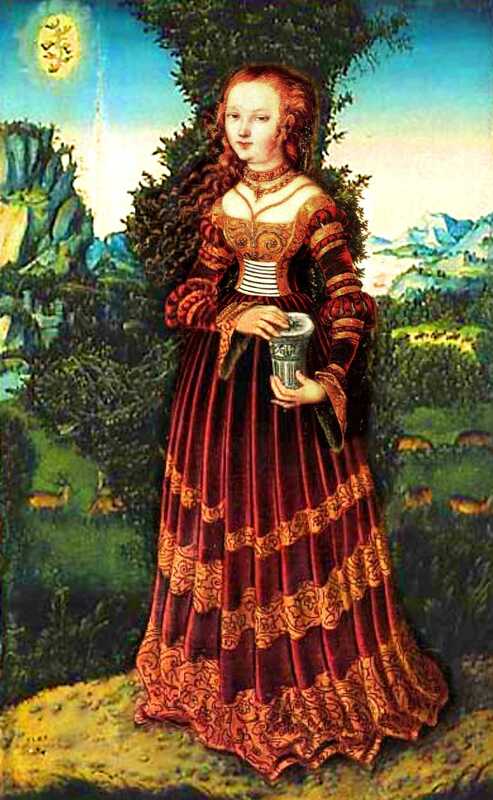 This painting of Anna Cuspinian from 1502 doesn’t show the typical ‘Cranach’ gown. Nevertheless it shows something that strongly resembles a Brustfleck – just that this ‘Brustfleck’ seems to be the very broad border of a chemise! Something like a reinforcement around the chest – a Renaissance bra, so to speak, with white fabric sewn below it as some kind of ‘camisole’. I think this is actually the idea that I like most – the Brustfleck being part of some kind of supporting camisole. The chemise (with the heart shaped neckline) would nevertheless have been worn with this camisole, to protect it from sweat – just like chemises that were a bit later worn under stays, and *much* later under corsets. 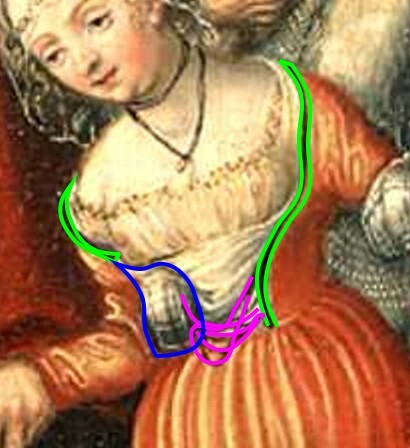 The gathered stretch area around the chest would be the ‘Brustfleck banding’, probably laced in the back because historically there wouldn’t have been stretch fabric (and I don’t think the Brustfleck was cut on the bias, either; and that doesn’t stretch *that* well, either). 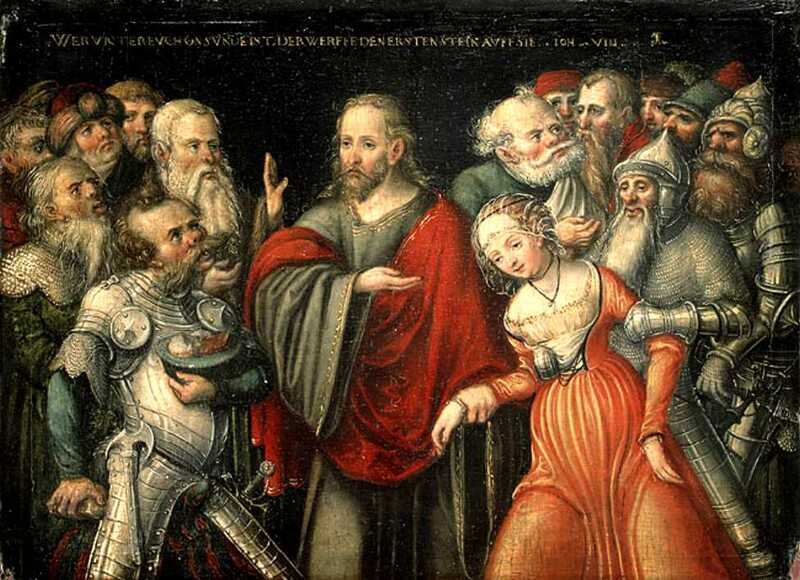 The fabric hanging down would – due to the fact that the Brustfleck is not gathered – also not be gathered; this is the white stuff that we see behind the lacings in the Cranach paintings. I think the front side guards may also be pinned to the Brustfleck, but I have found no evidence of pins in any painting. However, as front- and back neckline of the bodice are so deep, this seems to be the only solution for preventing the shoulders of the dress to entirely slip down. So this is the way how I will construct that Brustfleck – as a camisole, which will be worn under the front opened, laced bodice. So the bodice has strips of fabric as guards along both front side openings, and lacings from below the Brustfleck downwards up to slightly below the waistline. 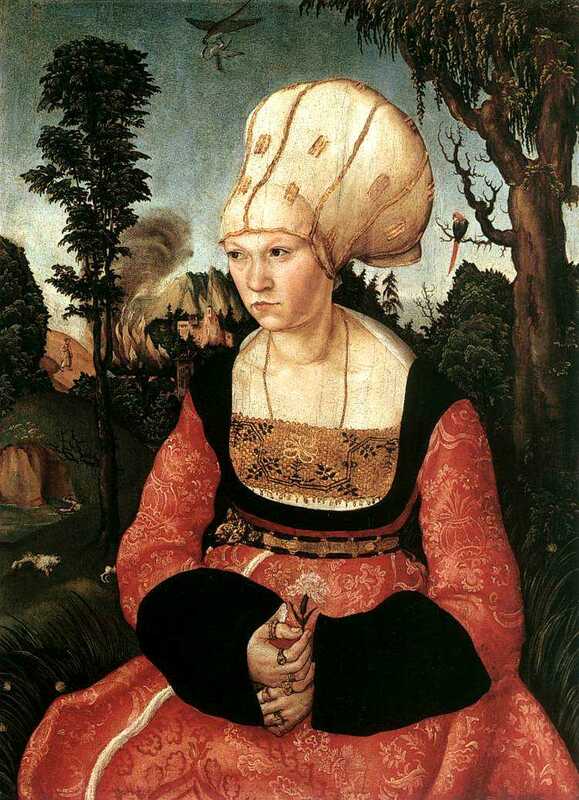 That is something all fully-dressed Cranach portraits featuring this type of gown have in common. But what would the bodice look like from the backside? The back of the bodice almost just consists of the deep neckline, which goes down in a ‘U’ shape almost to the waist! If it looks as if the bodice was laced on the back in the first picture, look again – that’s black smocking on her chemise, not lacing. I think I’ll go for the separate bodice and skirt option. Even if the chemise seems to be absent, there are white puffs showing below the sleeves that seem to belong to the bodice. This is why I assume that the white puffs – at least for this dress – are built into the sleeves; and that’s how I will do it. 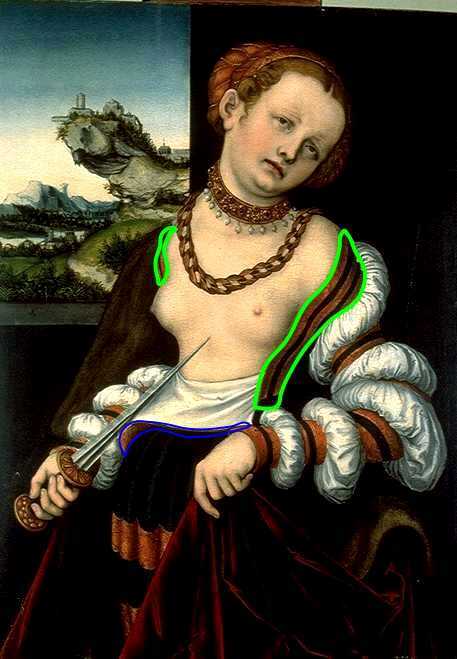 Nice work, but the way I see Lucretia potrait with “waistband” is different. My opinion is that golden part is wrong side of “brustlefleck” not waistband at all. It’s clearly attached to the white part, but skirt is more like under it than attached to it. First, the coloring. 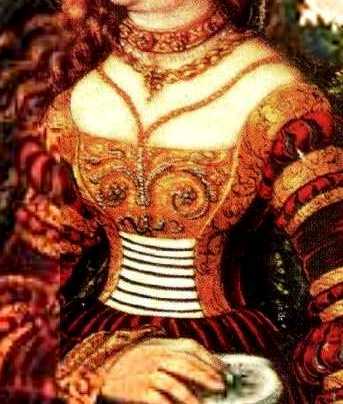 A Brustfleck would usually be similar in color to the two guards on the sides of the bodice; but what we see in the Lucretia painting is neither the skirt’s color nor the guard’s color – it looks ‘misplaced’ in the painting, matching nothing else – like, for example, a lining- or stabilizing fabric would (such as a waistband). It’s, of course, always a balancing act. No one living in this world has, to my knowledge, ever seen the construction of an original Cranach gown, because none of them survived. So it will always be just guessing from paintings – and paintings always have some kind of interpretation of the artists in them; so it’s difficult to say if something was really done the way it was painted or not. What a fantastic amount of work you have done! 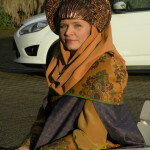 I am studying the paintings of Judith as I am preparing lectures on biblical women in art – having studied art history. This is fascinating, well done.